November 14 update: Mayor Watts declines to run for the Liberal Party leadership. As a commenter here stated, she puts her family first at this stage of life and also says her job as Mayor in Surrey is unfinished. Good reasons both. 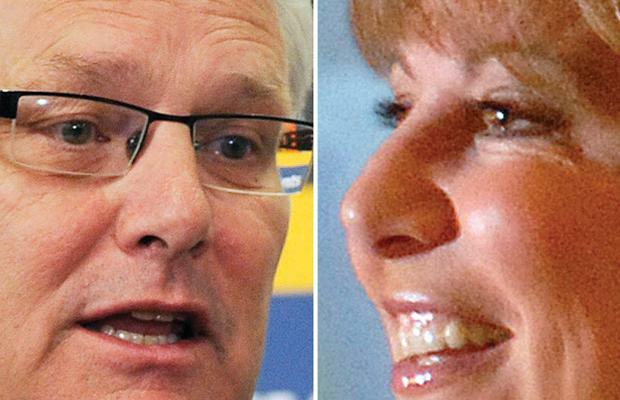 In the second half of 2010, Liberal party members learned that Gordon Campbell would soon be man overboard. Despite diligent bailing by friendly mainstream media, the Premier’s political boat floundered. Citizens were reading alternative media in ever growing numbers and, by October, even the Vancouver Sun admitted that Campbell’s support had hit “rock bottom.” By then, the back room masters of the BC Liberals had concluded a leadership change was necessary. The Liberal Party is polling above Campbell but well behind the opposition NDP. Because reputations of once-potential leaders such as Mike de Jong, Colin Hansen and Kevin Falcon were dirtied through association with the Campbell government, a shiny new outsider is the only considered alternative. Campbell, having participated in the coup against previous Liberal Leader Gordon Wilson, knew the tricks that could be employed against him if he tried to hang on. Campbell knew his vulnerability and after abject failure of his November 3 TV speech, the Premier, out of options, agreed to resign. However, he and the back room influencers from big business aim to control the agenda for as long as possible. There are files to be shredded, small and large patronage to be awarded and longterm commitments worth billions to be finalized. The gravy train needs a smooth road to continue chugging down the line. It cannot be rocked by the rough ride of uncertain leadership. I’m not pals with Dianne Watts nor any of the Liberal dance-masters. In fact, I’m as outside that loop as one can be. Of course, knowing little about Ms. Watts does not stop me from commenting on the possible next Premier of British Columbia. After all, pundits never lack opinions. We’re profilers but, if needed, we read tea leaves. First elected Mayor of Surrey in 2005, Watts swept back three years later, with six times the votes of her closest competitor and she demonstrated powerful coattails for her Surrey First slate. Before October, she claimed no ambition to lead the BC Liberal Party. November 15, Mayor Watts appeared on CKNW, the BC Liberal host broadcaster. She will discuss leadership but may not be ready yet to announce her candidacy. Negotiations with kingmakers (queenmakers?) must be completed. 11:58:30 am – Promo for Monday interview on CKNW with Dianne Watts (“. . . the potential saving grace for the BC Liberal Party!”) about her political future. . .
12:01:13 pm – News report about a Liberal Party “townhall” meeting with three Liberal MPs and Richmond Secondary students. 12:03:47 pm – News report reminding us that “Dianne Watts is keeping a close eye on a high profile criminal trial…“ with voice clip about sentencing of an impaired driver. 12:15:07 pm – News reader Gord MacDonald introduces Christy Clark and asks her to explain why the Liberals are considering changing from the one member – one vote system for election of a new leader. This leads to Christy explaining that the provincial party wants to ensure it is not dominated by urban populations of the lower mainland. She tells us that one vote is not equal to another but her show would have a number of guest discuss the dilemma. 12:32:43 pm – Speaking at a town-hall meeting in Richmond, [Liberal leader] Michael Ignatieff says blah, blah, blah . . .
[Members] recognize the responsibility of broadcast journalists to promote and to protect the freedom to report independently about matters of public interest and to present a wide range of expressions, opinions and ideas. Is a broadcaster who largely works as a mouthpiece of the ruling political party paying respect to the required standards? Is it time to start holding stations to account by using the complaint facilities of the CBSC? Dear Colin . . . It's not only time Norman, it's well past time. Nonetheless; I wouldn't expect anything of substance from the CBSC when it comes to Corus…or anything the Campbell government wants done. As for Watts running the libs…sorry, the only difference I see between her and Campbell is she wears a skirt. She is pro big business, pro developers, pro money. How is this change? I agree with Leah – Watts is more of the same old same old – Gordo in a skirt. CKNW, especially Bill Boring and his fellow LIEberal boot-lickers, is not worth listening to (it has some reasonable programs, but NOT week day mornings). Residents of the LM and Surrey my k now who Dianne Watts is. What about the rest of BC? We don't know her except that she is from the shave and pave jet set. Whenever I drive through Surrey, I can't wait to get out of there. I would rather recall this BC Liberal Nazi party, and fling them right out into orbit. That is the only way BC will be safe. Campbell's address to the province, giving in his resignation, is just one more Campbell dirty tactic, to stall for time. He warned, he would still be around for some months. He also said, he would continue on with his work. Which is of course, dirty work. The vendetta, on the restaurants, for not supporting the HST. The threat to Sears, for having, HST free, sale days. Trying to intimidate, BC people into not signing the recall, by having the RCMP investigate 7 signatures, that Elections BC had in their hands for months. Yup, Campbell, is indeed still around. Campbell should put the RCMP's use of time, to further investigate, Campbell's corrupt sale of the BCR. Campbell should have the RCMP, investigate the sea to sky highway plot. That would be more meaningful and valuable, for the RCMP's time. However, the RCMP will do what Campbell dictates to them, or their BC Provincial contract, will not be renewed. How many BC Liberal ministers, have been under investigation now? I have lost count. And of course, De Jong, took care of the Basi/Virk, as was promised them, if, they kept their mouths shut. So, Basi/Virk, got a very sweet deal, but, part of the deal was, they can not ever discuss, Campbell's corrupt sale of the BCR, ever again. Hmmmm. Nope, the entire BC Liberals, crime family all have to go. Norm, you're wrong on this one. Watts is flattered but she's out. She has a good gig going in Surrey, she has around 5 – 10 minute drive to home from City Hall, and she has two teen-aged daughters (aged 15/16) whom she adores and enjoys watching them at local sporting events. Even people close to Watts have confirmed she's not in the game. Her appearance on 'NW Monday morning will be to thank people for their unsolicited support and also to discuss issues facing BC as a whole. That's about it. I suspect John Sherman may be correct here. Today, Liberal Party leaders, instead of setting a date for a leadership convention, decided to hold a vote to change the rules for electing a leader. They might not have the new rules until February 2011 and the leadership vote could follow months after that. Campbell's exit might be one of the slowest on record. He is leaving is he not? The 'Eye' has a good friend who is quite up on BC politics and according to him, the problem for the Liberals will be no one will turn up to vote. He has seen a poll that the next provincial election will see a 45% voter turnout as the electorate, almost en mass, will refuse to vote and instead, sit at home and let events unfold. The problem for the Liberals in this scenario is that, those who will vote, will vote against the Liberals! Unless there are some quality independents like Viki Huntington,in Delta South, will see empty polling stations on election day. From the same poll, people are growing madder at Campbell and the Liberals on a daily basis and we may soon see major rifts forming when the first recalls start to happen. Watts will stay in Surrey until the next election, where she will run for the leadership in 2015.